In the first round of the 2014 British Open, 15 players out of the 18 total that shot 69 or better had teed off during the morning slots. During the afternoon, Royal Liverpool GC played much harder with significantly harsher weather conditions. Although this magnitude of discrepancy in performance between afternoon and morning tee times is extreme and perhaps rare, many golfers overlook the influence of tee time on their score. There are two practical theories for how a golf course responds to high usage. It’s possible that the course, specifically the greens, get torn up and the balls roll slower (becomes easier), or the course firms up and plays faster (becomes harder). Using data from pgatour.com, it is possible to analyze the impact that the course’s prior use has on each player. As expected by the central limit theorem, this difference is approximately normally distributed. What’s most interesting about this data is that it is not centered around zero. 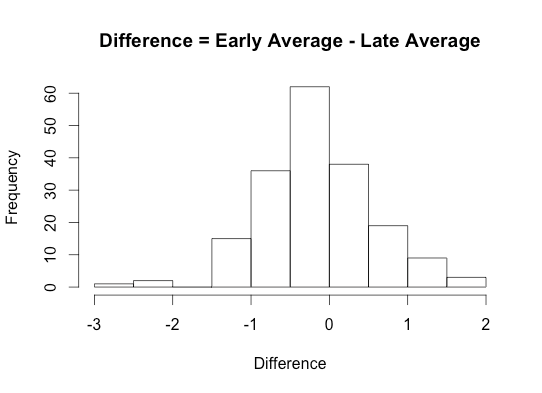 As the histogram shows, its mean is -.1544, and given the standard deviation of .710, we can reject the null hypothesis that afternoon scores have the same mean as morning scores with a two-sided p-value of 0.004. This suggests that courses play more difficult in the afternoon, perhaps due to increased firmness of the greens. It’s plausible that the better golfers are less affected by the course’s increased firmness than those weaker golfers. After all, there must be a reason why Rory McIlroy consistently outperforms Boo Weekly; however, a simple analysis disputes this claim. 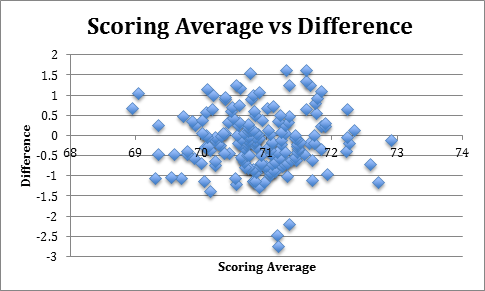 As apparent, there is a almost no correlation (R = -.02) between scoring average and difference, suggesting that both better and worse golfers are equally affected by the golf course’s natural changes. There is no debate on whether playing conditions affect a golfer’s score, and it is accepted that a golf course changes with constant use. Now, it’s fair to assume that golf is most challenging on that Sunday afternoon, moments before a champion is crowned. Perhaps, the USGA place the leaders in the latest tee times to even the playing field and make the action more exciting. Let’s be real, golf needs all that it can get to keep itself on the TV screen. It’s good to see the math behind what most of us thought intuitively, that afternoon scores would be higher. I’d like to see a different, but similar study done. Namely, in the first two rounds, a player either has early/late or late/early starts. I’d like to know statistically, is it better to be assigned an early start for the first round and a late start for the second round or vice versa. In this, you aren’t testing morning scores versus afternoon scores as the above study suggests that the afternoon scores are going to be higher regardless of which round it was. What I’d like to know is this, “Is it better to have a morning tee time in the first round followed by an afternoon round in the second round or vice versa?” In this, you would only need to do the stats for the first two rounds. This would vary by individual and personality, but I’d like to know if there is a statistical difference one way or the other. May the Authors give an answer? I find your question verry interesting and logic. They schould do a new analyses wit the first teo rounds. Btw, wind is a major driver of poor performance in the afternoon. On average, wind speeds increase from dawn until mid-afternoon. I mean the effect on wind on ball flight, not on drying the greens. I suspect what you’d find in a comprehensive analysis is that: drives travel farther in the air (and added roll) the later the tee time; greens’ stimp-meter rating increases throughout the day (walking, sun, wind, and lower air humidity); shots are much harder to control in the air due to PM wind.